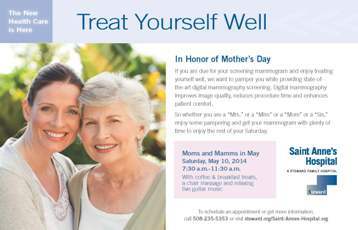 Fall River, MA – Mothers, daughters, sisters, aunts, and best friends are invited to celebrate a healthy Mother’s Day at a special “Moms and Mamms” offering of Saint Anne’s Hospital’s popular “Treat Yourself Well” screening mammography program on Saturday, May 10, from 7:30-11:30 a.m. at the Robert F. Stoico/FIRSTFED Center for Breast Care. During this special Mother’s Day edition of the hospital’s popular “Treat Yourself Well” mammography event, the center’s staff will pamper attendees with complimentary coffee and breakfast treats, chair massage, and relaxing live acoustic guitar music while providing state-of-the art digital mammography screening. Digital mammography improves image quality, reduces procedure time and enhances patient comfort. So whether you are a “Mrs.”, a “Miss,” a “Mom,” or a “Sis” ... enjoy some pampering and get your mammogram with plenty of time to enjoy the rest of your Mother’s Day weekend! A physician's referral for a screening mammogram is not required; however, appointments are required for this special event. Appointments are available from 7:30-11:30 a.m. To learn more or make your appointment, call 508-235-5353. • Mondays, Wednesdays, Fridays: 8 a.m.-3:30 p.m.
• Tuesdays: 6:30 a.m.-6:30 p.m.
• Thursdays: 8 a.m.-6:30 p.m.
• Second Saturday each month: 7:30-11:30 a.m. Established in 2001, the Robert F. Stoico/FIRSTFED Center for Breast Care at Saint Anne’s Hospital is the area’s largest hospital-based center dedicated to breast health. The center offers a dedicated nurse navigator; all-digital diagnostic capabilities, including mammography, ultrasound, breast MRI, sentinel node biopsy, stereotactic breast biopsy, needle localization, and bone densitometry; and a full range of coordinated medical and surgical breast health treatment options, including comprehensive cancer care and access to national clinical trials through Saint Anne’s Hospital Regional Cancer Center. The center also offers bone density testing. Also known as a DEXA scan, bone density testing can monitor the effects of age, diet, or treatments on your bone status. Bone density testing is available with a physician's referral. Convenient appointments may be made by calling 508-235-5353. Steward Health Care System LLC is the largest integrated community care organization in New England which combines more than 3,000 physicians, 11 acute care hospitals, managed care, insurance programs, home care, an imaging operation, and a number of other post-acute services, to provide the most cost effective and highest quality of integrated patient care.